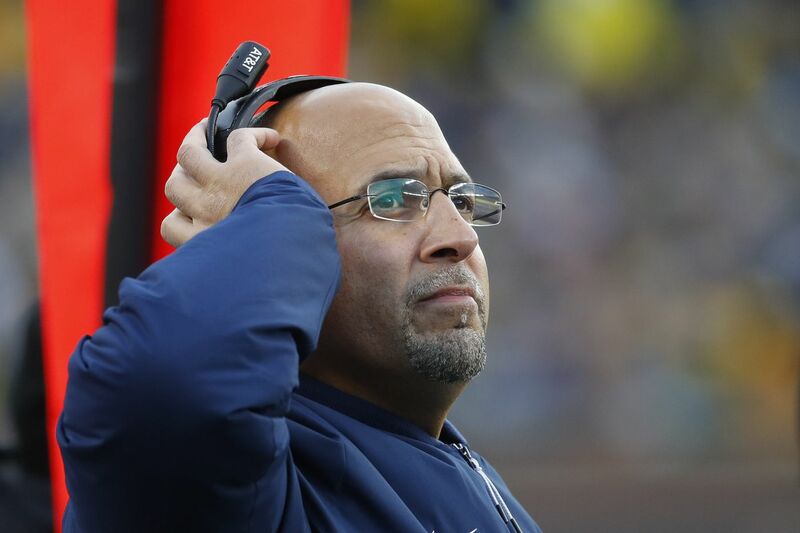 Penn State head coach James Franklin watches against Michigan on Nov. 3. Adisa Isaac, a defensive end from Brooklyn, N.Y., has announced he has given an oral commitment to Penn State. The 6-foot-5, 220-pound Isaac, from Canarsie High School, made his announcement Monday in a video on Twitter. He said he received 30 offers from FBS schools and narrowed his list to Penn State, Miami, Syracuse and Texas A&M before choosing the Nittany Lions. Isaac was rated four stars and considered the No. 1 high school prospect in the state of New York by both 247Sports and Rivals. He was ranked No. 4 in the nation among weakside defensive ends by 247Sports and sixth by Rivals. With the first National Signing Day coming up on Wednesday, Isaac is the 17th player to make a commitment to Penn State and the second defensive lineman. The Nittany Lions list of recruits is ranked 11th by Rivals and 13th by 247Sports. In other Penn State news, redshirt freshman linebacker Brelin Faison-Walden announced he is transferring to Charlotte. Faison-Walden, a resident of Greensboro, N.C., who played in one game this season, said on Twitter that family health issues at home prompted his decision.